What’s in an Art Lesson? Heads down with pencils and brushes in hand, a group of elegantly dressed women are engrossed in the act of drawing. Meanwhile, two male instructors, conspicuous in their dark frock coats, observe their work. Yet these are not art students learning their trade in a master’s studio. Rather, this remarkably detailed watercolor by an unknown artist depicts a drawing lesson for well-to-do amateurs. Other artistic practices considered appropriate accomplishments for middle and upper class women during the early-nineteenth century are present here as well. On the right, a woman in a broad bonnet arranges flowers, while an embroidery stand reveals the work of a dedicated needlewoman. At first glance, the private salon in which this lesson takes place might seem plainly furnished, with its bare wood tables and chairs. But details like the large crystal chandelier and the paintings in their fine gilded frames reveal that the watercolor’s creator intended to portray a genteel setting. Indeed, one of these paintings provides an essential clue to the room’s identity. Unlike the smaller, cursorily rendered pictures, the large painting on the back wall is captured quite precisely. It bears all the essential traits of Pierre-Henri Révoil’s Jeanne d’Arc prisonnière à Rouen of 1819 (fig. 1). Révoil was a pioneer of the troubadour style, a type of history painting popular during the Restoration period that took Medieval and Renaissance themes as its subject. Exhibited at the Paris Salon of 1819, Révoil’s Jeanne d’Arc was immediately purchased by Marie-Caroline de Bourbon-Siciles, the Duchesse de Berry (1798-1870), an important patron of the arts and a prolific collector of troubadour paintings. After her husband, the nephew of King Louis XVIII of France, was assassinated by a political adversary in February of 1820, Marie-Caroline moved into the Tuileries palace with the rest of the royal family. Her collection of modern French paintings, including Revoil’s Jeanne d’Arc, followed her there shortly thereafter. Although the Tuileries palace is no longer extant, an 1826 inventory gives us a sense of how its interiors were decorated. Three rooms in the Duchesse de Berry’s apartments—the Salon de Billard, the Grande Salle à Manger, and the Petit Salle à Manger, also known as the Salle de Dessin—were outfitted in green damask and un-gilded mahogany furniture, much like room in the Cooper Hewitt’s drawing. The Duchesse de Berry was both an important art collector and an amateur artist, whose instructors included the miniaturist Auguste Garneray and the landscape painter Ferdinand Storelli. 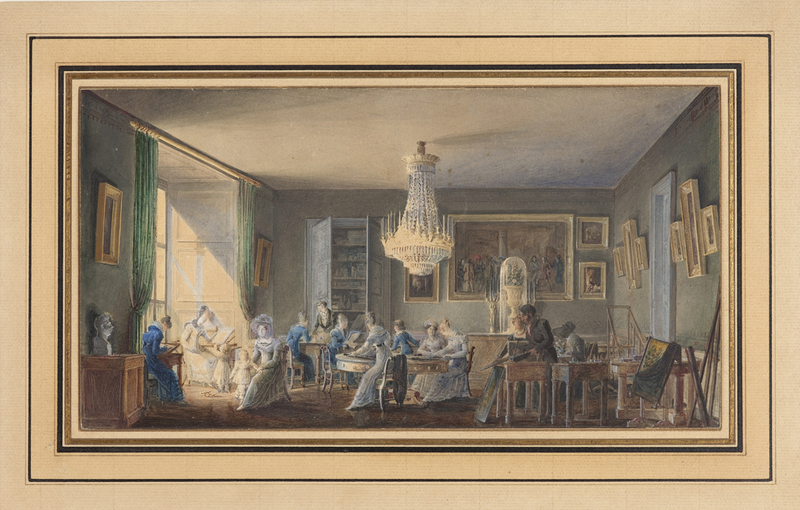 Identifying the setting of the Cooper Hewitt’s watercolor as one of her rooms in the Tuileries can help us better understand the social and material setting in which the artistic training of such elite women took place. It also puts the Duchesse de Berry’s amateur art practice in direct dialogue with her collecting—both of which were marked by a taste for the historical themes and slick aesthetic of the troubadour style (fig. 2). The watercolor is an excellent reminder that the French term amateur refers not only to a non-professional artist, but more expressly to a lover of the fine arts with decidedly good taste. Since at least the eighteenth century, such an amateur exercised his (or more rarely her) good taste primarily through collecting; but, as recent scholars have argued and as this exceptional drawing shows, artistic practice was an equally significant component of the amateur’s identity and authority in matters of taste. Figure 2: Marie-Caroline de Bourbon-Siciles, Duchesse de Berry, Messe du soir dans un couvent, 1842. Oil on canvas, private collection, France. Marina Kliger is a PhD Candidate at the Institute of Fine Arts at New York University. She is currently working on a dissertation about women, gendered historical consciousness, and the troubadour style in early nineteenth-century France. Marie-Claude Chaudonneret, Fleury Richard et Pierre Révoil : la peinture troubadour (Paris: Arthena, 1980), 135. On the Duchesse de Berry as a patron of the fine and decorative arts, see Entre Cour et Jardin: Marie-Caroline, duchesse de Berry (Sceaux: Musée de l’Île-de-France, 2007). “Tableaux transportés de l’Élysée-Bourbon aux Tuileries, dans l’appartement de la duchesse de Berry, 8 avril 1820,” 371/AP/7, Fonds du château de Rosny /Archives du duc et de la duchesse de Berry, 1796-1869, Archives Nationales, Paris. “Tuileries, Inventaire du Mobilier, 1826,” AJ/19/158, Palais des Tuileries, inventaires et journaux d’entrées, Archives Nationales, Paris. Three paintings by the Duchesse de Berry were exhibited for the first time in 2011. See Carole Blumenfeld, et. al., Petits théâtres de l’intime: La peinture de genre française entre Révolution et Restauration (Toulouse: Musée des Augustins, 2011). On the figure of the amateur in the eighteenth century, see Charlotte Guichard, Les Amateurs d’Art à Paris au XVIIIe siècle (Seyssel: Champ Vallon, 2008).